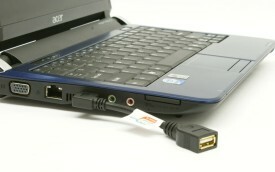 This cable allows you to extend both USB and USB 2.0 cables with ease! The right angle on it gives you maximum flexibility when you're in a tight spot. As you can see with our images below, it works great with the new netbooks that are available, like the Acer Aspire One. It's great for using with wireless broadband adapters, thumbdrives, activation dongles, etc. This USB 2.0 extension cable has been used mostly by portable users who don't want to have a lot of extra cables with them in a big bunch. It's amazing how helpful short cables can be in your little portable computer bag! Right Angled USB A Male to A Female.